One wouldn’t expect to see a field of corn in the middle of Dublin, yet that’s what you’ll find, surrounded by corporate buildings and traffic lights. 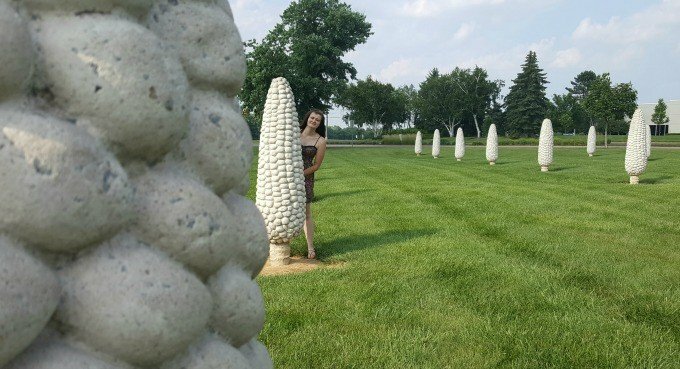 Thirteen rows with 109 concrete ears of corn that each stand over six feet tall comprise the Field of Corn (with Osage Oranges) roadside attraction to pay homage to the once rural area’s agricultural background. 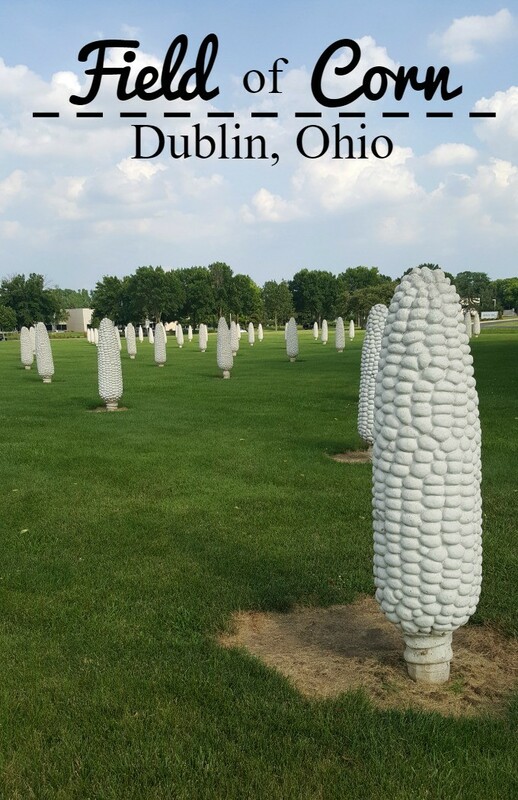 The project, by artist Malcolm Cochran, a professor of sculpture at the Ohio State University was commissioned by the Dublin Art in Public Places program and dedicated October 30, 1994 on land that was once farmed by Sam Frantz, who developed hybrid corn. The park is now named Frantz Park. 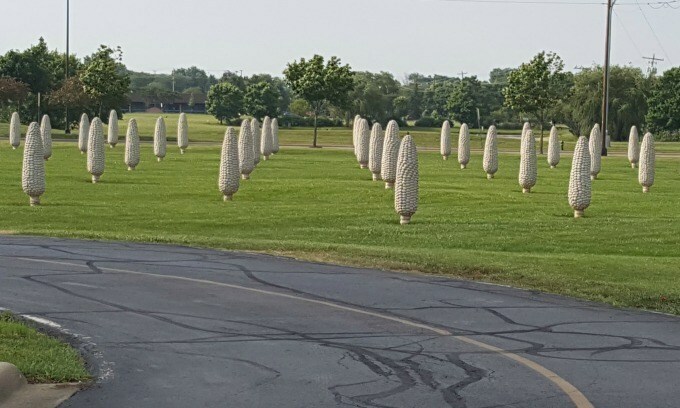 You may think the ears of corn are identical to one another, but three molds were used to create the larger than life sized ears of corn of pre-cast white concrete. Each ear weighs over 1500 pounds and is securely positioned with a three foot concrete foundation. Three different molds were used to create the human-size ears that were made of precast white concrete in Dalton, Georgia by the Cook & Ingle Company. 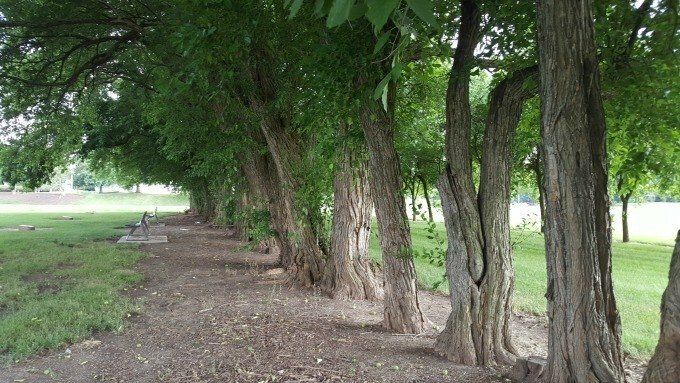 Bordering the field is a row of Osage orange trees that date to the 19th century. You’ll also find bronze placemarkers that tell visitors the history of the land and how corn was planted and farmed by the Indians who once called the land home as well as the settlers who later inhabited the land. 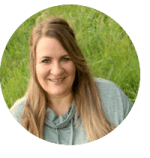 Want to plan a visit of your own? You’ll find this unique park at 4995 Rings Rd, Dublin, OH, minutes from 270 and the Tuttle Crossing Mall. While you’re in the area, stop to see the Giant Dancing Hares which are located only a few minutes away. 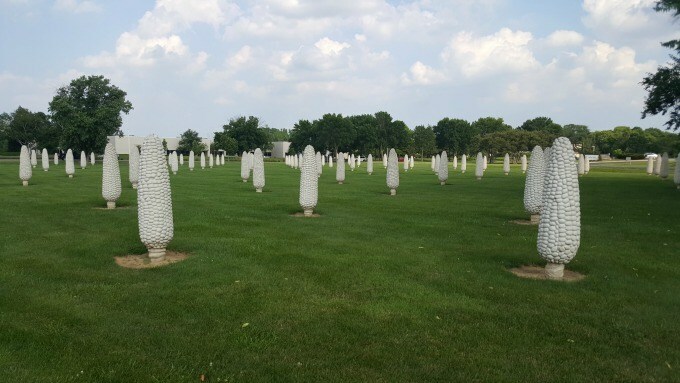 Have you visited the Field of Corn (with Osage Orange Trees)? This post was originally published on June 28, 2010. I’ve been here! We stopped on our way through a couple years ago. It started to rain (and it was November – so also cold!) so we didn’t stay long. It was a fun way to break up the drive though. I’ve seen it dozens of times and still stop when I drive through Dublin. You’re right, it is a fun way to break up a trip. I’m glad to hear that you enjoyed it! We went here today! It was interesting! Loved Dublin and the other sites! ??? Glad to hear you enjoyed it! Dublin has some fun sites! 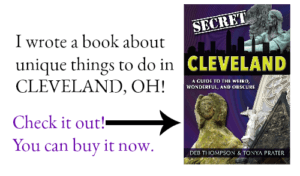 I am originally from Ohio and never knew about this! I was actually in Columbus a couple weeks ago and could have made a stop! Saving this for another day. What a fun post! It’s not one of those well-known attractions but if you like fun & quirky, it’s definitely worth the visit. Amazingly enough, I'm going to be in Dublin for a family reunion at the end of July! Very interesting looking place. We love corn mazes too and I'll have to be sure to check some out this fall! We've not been to the shoe house in PA, but it's on our list of places to visit. We watched a documentary of roadside attractions and the kids made a list of all the ones they want to see. Wow!When I read that title I thought you were talking about the corn mazes that are so popular in the fall. How surprised I was to see the field of corn instead. LOL! DS says it looks like the corn is made out of golf balls! That is too funny! My kids would get a kick out of that too. I have one more field trip planned for your travelers and then I will get them heading home to you. Thanks for the exchange!